This entry was posted on July 1, 2016 by B4S. First there was Skype, then there was Microsoft Lync, then there was Skype for Business.  Whether you are a small business making the most of the localised Skype installation on your PC or a larger business enjoying the full gamut of integrated services from Office 365 Enterprise E5 you will need that perfect headset which allows a worker to get the most from this intelligently devised Unified Communications system. Gone are the days of the basic headset - we highlight below some of the features that manufacturers have included in their offerings to make it just intuitive to use. 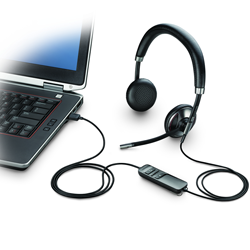 We love the SC 70 USB MS from Sennheiser - this, like many Skype headsets, is a USB headset and is binaural. As one would expect from a Sennheiser headset this delivers an excellent audio quality whilst being comfirmatble to wear for long periods. It is best for Skype for Business becuase of the call management and handling features which are accessible from the line cord - supporting redial, volume control, mute and redial straight from the in call control unit. This is a Skype for Business certified headset. Another headset that has to be mentioned in this conversation is the Jabra Evolve 20 - in this case a monaral USB version this also carries the sort of inline call controls which make accessing aany UC platform a simple and efficient process. What we really enjoy about these headsets are the attention to detail in the design and look of these. The inline control is one of the easiest to use whist the headset supports wideband audio, noise cancelling and digital signal processing. 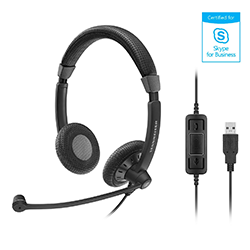 Plantronics have, perhaps, more legacy in headset manufactuting than any and their Blackwire series are synonymous with Unified Communications and, hence, very suitable for Skype for Business. The Blackwire 725 is a binaural USB headset with hi-fi stereo performance and active noise cancelling technology. We love what Microsoft refre to as smart sensor technology which allows one to answer a call by just putting the headset on. The headset's design also allows it to be very simply folded up into a carry case - perfect for those accessing Skype on the road. 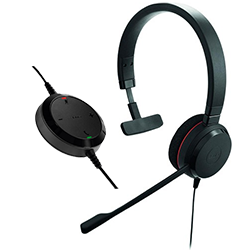 Whilst predominantly one thinks of UC/ Skype headsets as USB connected there are also Bluetooth Versions which are suitable in many working environments. 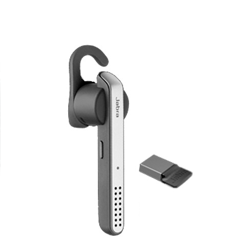 The Jabra Stealth Bluetooth headset is a perfect example of a lightweight but versatile headset that can be taken anywhere, and as long as you have internet connection you can access all the features of the platform. With a UC-compatible dongle, you can even transfer calls from your softphone to your smartphone using the Jabra Stealth UC. 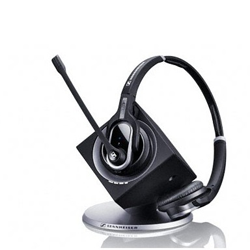 This is a perfect Skype headset for hot-desking workers or those on the road. The 30m range allows for a decent amount of freedom in the office as well. The Sennheiser DW30 is one of our staff favourites being a fully featured binaural desktop headset that utlises cordless DECT technology to give a large available range from the base station. It has also a long battery life, which coupled with its unobtrusive comfort makes it an all day headset. Naturally volume and in call controls can be accessed from the headset itself. Its sound technology makes use of an integrated noise cancelling microphone and Wideband audio mode for an unsurpassed in call quality.